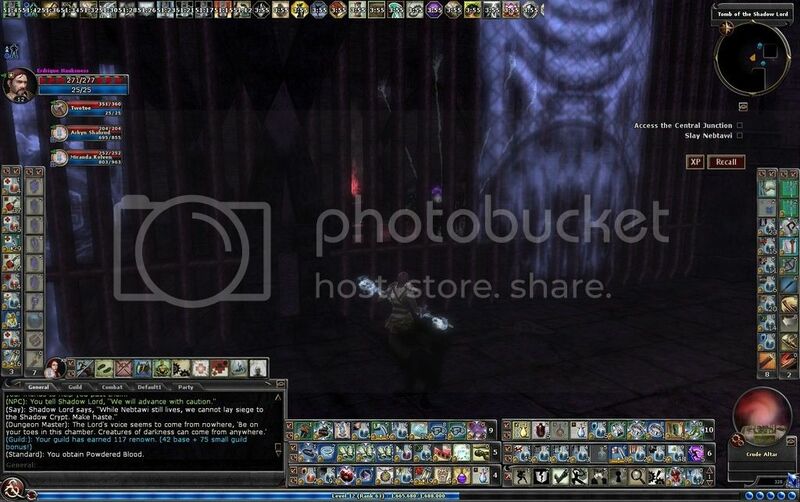 One of the more classic story arcs in DDO is the Vault of Night. The Vault of Night story arc consists of the following quests: Tharashk Arena (VON 1), The Prisoner (VON 2), The Gateway to Khyber and The Jungles of Khyber (VON 3), Haywire Foundry (VON 4), The Vault of Night (VON 5), and the Plane of Night (VON 6). The last two quests in the chain are raids and to get into VON 5 you have to complete the previous four quests first. You used to have to do these in a specific order (hence the reason why they are numbered VON 1 through VON 6 by many players) but this is no longer necessary. One of the quests to complete, Haywire Foundry, requires you to make your way through a manufacturing plant and saving the artificer Haywire in hopes of recruiting him back into the Laughing Knives (I wondered specifically about Haywire here). If you have picked up the story arc for the Vault of Night from Marek Malcanus, you will eventually learn about Phineas Haywire. Haywire has lost some of his confidence after the Laughing Knives couldn’t break into the Vault of Night and is now working in his foundry located in House Kundarak. 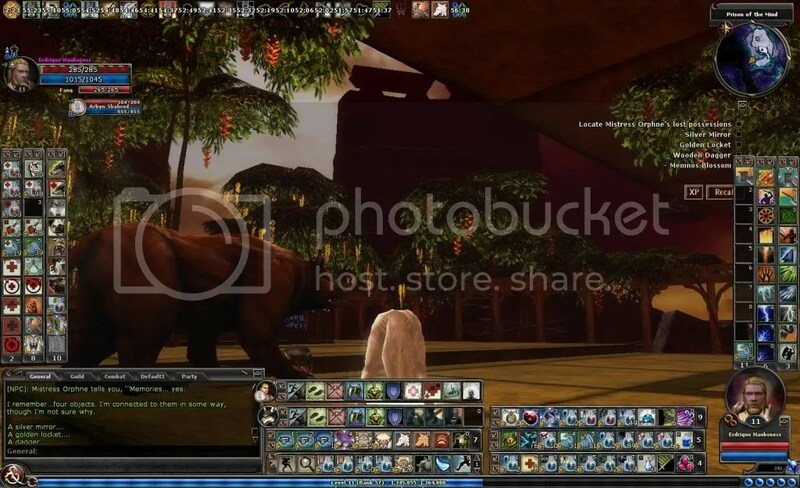 You also learn that one of his assistants has been spotted waiting for him on the side of the bank in House Kundarak not to far away from the port that houses ships that head out to Ataraxia’s Haven or Three Barrel Cove. The name of assistant is Arlsie For (a warforged). When you catch up to Arlsie you learn that the assistant hasn’t heard drom Haywire in sometime and that he is worried about him. He then tells you where Haywire’s Foundry is located. Sludgge picking up the quest Haywire Foundry (VON 4). The entrance to Haywire Foundry is close to the Ever Full Flagon near the entrance to the House Kundarak Ward. Right outside of the entrance is another warforged named Husk who is actually a collectible turn in trader. There was a time when Husk was actually the assistant for Haywire, just as a quick side note. Haywire Foundry isn’t a complicated quest and it doesn’t have a complicated map either. When you enter the foundry you actually come into a large curvy hallway that leads into an open cavern that is filled with lava and a single stone pathway leading to a locked gate. Within this room is a lever, along the cavern wall across the lava, that needs to be pulled in order to raise the gate. In this room, the lever is guarded by a few elementals (fire and earth). Defeating these elementals is an optional objective and makes pulling the lever easier. Once you raise the gate there is another lever mounted on the wall and another gate. On the other side of the gate is another warforged that you need to talk to, RC-2. RC-2 tells you he will take you to Haywire and to pull the lever on the wall when you are ready. Sludgge at the entrance to Haywire Foundry. Sludgge inside the foundry and getting ready to pull the lever to raise the first gate to find Haywire. This is when the quest really begins. Shortly after the next gate is raised, RC-2 goes a bezerk and attacks you. It is another optional objective to take it down. When you defeat him, you see some type of parasite leave his body and disappear. You then realize that you are inside the foundry. The initial layout to the foundry is like a cross. After you defeat RC-2 and continue to make your way north, you will come across some more warforged and a speaking stone mounted in the wall. After defeating the warforged combatants and using the speaker stone, you learn from Haywire that something has gone horribly wrong and his creations have turned on him. To protect himself, he has locked himself is in security chambers in the upper reaches of the foundry. However, to get to that point, you have to lower the shields that have been activated and stop any more travel to the north in the foundry. Preparing to deal with RC-2 as he gets ready to go beserk. Battling some defiant drones in Haywire Foundry. So where is this painting at? Just something Sludgge notes in the hallway to the speaking stone. At this point you can either go east or west. I typically go east first. If you have a group, you can split up into different directions. Each direction poses different challenges and each one has a main control lever that needs to be flipped in order for the force field blocking the passage to the north to be lowered. The passage to the east leads to a curving hallway that leads up into the foundry. This path has a number of pitfalls to be weary of, literally. These pitfalls are actually areas of the floor that completely break away and to a fiery lava pit below. The first one of these pitfalls can be actually be disabled. However, the second pitfall cannot be avoided. But, with that said, you can skirt the left side of the wall in the tunnel and when the floor breaks away you will land a some pipes that you can use to cross the gap. Speaking to this, there is an optional chest about halfway down this particular pitfall. Like the first pitfall, the bottom of this pit is covered with a pool of lava. About halfway down this fall is a tunnel that leads to a chest. The chest isn’t trapped or anything and ripe for some looting. However, once you loot the chest you need to enter a second tunnel that leads back up the shaft you just fell down in. As you make your way through the tunnel a number of acid spray traps will activate that will need to dodge. If you do happen to come down this way, then having jump will be useful as well as acid resistance as you make your way back up the shaft by jumping and climbing back up various pipes. Sludgge preparing to go down the eastern half of the foundry. Making my way down the path to the eastern side of the foundry. Dealing with some mithral defenders down the hallway. Staring down the second pitfall along the winding tunnel to the eastern side of the foundry. In the first tunnel leading to the chest down the second collapsible floor pit. Time to get some loot from the chest in the pitfall. Now having to deal with the acid traps as I make my way out of the pitfall. So more of those same acid traps. Once you make your way past these two collapsible areas of the floor, the hall will cycle around to a door. This door is the entrance way to the creation, forge, or production area (however you want to term it). The room is shaped like a large rectangle with two levels, essentially. On the ground level, there will be a number of fenced in cages, each housing a newly created warforged. There will also be some stacked crates along the walls also have some warforged casters and rangers prepared to attack. Along the western wall, in the center of the wall actually, will be a ramp leading up to a catwalk, or the second level. This ramp is trapped with the control box under the ramp itself. As you make your way to the catwalk you will be assaulted by a number of warforged enemies. You will also encounter a series of flame jet traps which can be turned off by pulling various levers scattered along the catcalk. There is an optional objective to turn off all of these jets. But be careful because use jet you turn off will free a warforged enemy from the cages below. Once you make it around the catwalk, taking care of flame jets and warforged along the way, you will encounter one of the levers that controls the force field blocking the northern passage. Be wary here, this particular lever is protected by two sets of traps. The first set of traps are easy to find but the second is a little more difficult. To deactivate the second set of traps, you need to hop onto the ledge that the lever is on and then snake around corner. The second control box will be in this location. Once you disable the second control box you will then be able to pull the lever without any repercussions. Sludgge pearing inside the broken down door to the forge area of the foundry. Inside the forge area ranging some warforged who are perched on some of the stacking crates. The dangers of firewalls in the forge area. The lightning guard golems here are only present on epic difficulties. Fighting to get to the catwalk. Looking for the trap box for the catwalk. The flame vents look quite intimidating. One of the levers that turn off the jets. The lever that is needed to unlock the northern passage is heavily trapped. Don’t forget about this trap box on the power lever either!! Once you have pulled the lever, you can make your way back to the floor level and deal with the warforged you just freed. You will also notice another lever on the eastern wall. This lever raises a set of gates that block two tunnels. These two tunnels lead to a shrine and to another set of tunnels that can take you to the other half of the Foundry, although at this point the bars are still up on this side. Once this portion of the foundry is clear, you need to make your way back through the winding tunnel and across the pitfalls so that you can enter the western portion of the Foundry and activate the second switch. Unlike the eastern portion of the Foundry, which is asked by taking a winding tunnel upward, the western portion of the Foundry is accessed by climbing a flight of ramps that are trapped throughout the climb with some large blade traps. At the top of the ramp, you will enter a small hallway with another door. This door leads to another rectangular shaped room. This room is a storage and shipping area. Like the eastern side, this room has two levels. The second level consists of various alcoves that are directly above the storage alcoves on the bottom floor along wall. Each of these alcoves, bottom and upper floors, are sealed with a force barrier. This room is crawling with warforged that you will to take care of. Also, a short distance from the entry way to the room you will see the lever that raises the gates to those same tunnels from eastern room that leads to the shrine. Sludgge on the ramp to the hallway to the western half of the foundry, this is heavily trapped as well. Breaking down the door to the western half of the foundry. The western half of the foundry is the shipping and storage facility. You can also find the blood rage symbiont in this room, if you are lucky, from a breakable. Fighting our way through more warforged to another catwalk. Notice the barriers as well. And the fighting continues on the top level along the catwalk. Unlike the eastern half of the Foundry, the western half doesn’t have any traps but it does force you to fight in narrow and restricted hallways. As you make your way to through this room you will come across a staircase that leads to the second level. You will then make your way along a narrow catwalk tunnel that wraps around the room and eventually takes you to the second lever that needs to be pulled to open up the passage to the northern end of the Foundry. However, when you pull this lever, the power that was being used to generate the force fields for each alcove is turned off letting out a number of warforged. These alcoves also contained large crates, with may of them exploding when you approach producing even more warforged. This room is much more straight forward than the eastern foundry room but is just as dangerous because of the tight fighting spaces. As you make your way out of the western foundry room and back to the staircase, you will encounter another large blade trap that is only detectable after you pull the power lever and make your back towards the stair case. It is actually just before the staircase. Making my way to the next lever. Finally coming across the second lever. Now the northern passage to the foundry is open. This passage is another tunnel that leads to another intersection. It doesn’t matter which way you go when you reach this intersection because the tunnel at this point will form a small square. You can go completely around the square to take out all of the enemies just to make sure everybody, and everything is accounted for. When you reach the top of the “square” you will might detect a hidden door to the south. This hidden door leads to another shrine that is also protected by two more traps. This will be the last shrine you will have access too. Opposite to the shrine, to the north, is a gate. That gate is controlled by a lever and a little while after the lever is pulled it will reset and the gate will close. Once everybody passes the gate, they can’t go back (unless you use a dimension door spell or something like that). The room on the other side of this gate contains a number of rune wheels. In the center of the room is a chest that is sealed by another set of gates controlled by the rune wheels. The sequence to turn the rune wheels is based on the symbols that are on the pillars that are above the inside rune wheels as well as the symbol above the chest. The first thing to note is the symbol above one of the inside rune wheels. Then rotate the two outside wheels that are on either side of the inside rune to that symbol. When you do this, the inside rune wheel will be unlocked. This will then allow you to rotate the inside rune wheel to the symbol that is above the chest. When all three inside rune wheels are set correctly, the gates protecting the chest will lift up allowing you to access the chest, that contains a key. One thing to take note of, as soon as you enter this room, oozes will continue to spawn, including arcane oozes, until the gates are lifted. The path to the north is now open and it is time to fight our way through it. These mithral defenders once guarded the next passage to the north blocked by the portcullis in the picture. The hidden shrine in the northern half of the foundry, protected by traps as well as a secret door. The key that you pick up opens a locked door to north. This particular locked door essentially holds the “final” fight. Inside this room is the Master Control Unit (basically a powerful red named iron golem), a couple iron golems, and a few large adamantine defenders that need to be destroyed. Once they are destroyed you can get access to another chest that contains a second key that unlocks a portcullis that is protecting yet another control switch. Time to enter the rune wheel room. More lightning guard golems in the rune wheel room. These only appear on epic settings. Time to activate the rune wheels. Take note of the symbol above one of the inner wheels (here it is a capital H for the yellow wheel) and set the two outside rune wheels (one to each side of the yellow rune wheel) to that symbol to unlock the yellow rune wheel. Then set the yellow rune wheel to the symbol above the chest and move onto the next inside rune wheel. We can now reach the chest protected by the locked rune wheels. Time to the battle the guardians in the master control room. Need to take down the master control unit. The battle ensues in the doorway to the master control unit. Now, up to this point, Haywire Foundry has been pretty straight forward. This is where it starts to become the mad dash against the clock. As you loot the chest, you get a dungeon master narration that is mimicking Haywire telling you to listen up and that when you pull that particular lever the self destruct mechanism of the Foundry will be activated. When you pull the lever, you will have a few minutes to make your way through the rest of the foundry and to get to Haywire before you get blown up. It is best to buff yourself up with jump, haste, rage, fire resist, fire protection, acid resistance, acid protection, neutralize poison, greater heroism, and mass aid if you can before you pull the lever. When you pull the lever, a section of the way on the eastern side of the room will open up exposing a broken stairway. You need to make your way through this broken stairway and up the shaft jumping out of the lava covered shaft floor. When you get to the top of the shaft, you will come across another winding and up sloping pathway. This pathway is lined with a few acid and poison traps as well as number of mithral defenders. The chest that was protected by the master control unit and his guardians. The mad dash now begins. Hurrying up the path to Haywire. One of the optional objectives in this quest is to destroy ten of those mithral defenders. It is best to pull a number of them to a safer place along the pathway (outside of the traps) and to take them out as quickly as possible. It is good to do this to keep dungeon alert down. You can completely ignore them but it can get quite messy if you don’t take any of them out. Eventually you will hit a portion of the hallway that is split down the middle that leads to a large cavern. When you get to the cavern, it is best to hang off to the side of the room (as you enter the room hang a left and hug that wall). This is because once you enter this room the blast doors will close and the explosion from the foundry will generate a huge flash of fire that will shoot right down the center of the cavern. Keep in mind too, that when you enter this room, fire elementals will spawn. Just make sure to battle them on the side of the room. Eventually the draw bridge in this room will drop down allowing you to continue on to Haywire. The quest completes once you talk to Haywire and pick up the Lightning Rod. The cavern where the backlash of the foundry explosion will occur. Oh, and don’t forget the fire elementals. One thing I haven’t really mentioned yet are the types of enemy you will encounter in this quest. This quest is dominated by various types of warforged and their construct cousins. The various warforged include engineers, surveyors, troubleshooters, and drones. The engineers and surveyors are especially troublesome as they are the arcane and divine casters of the group, respectively. The surveyors are rangers and really like to cast barksin on themselves and the drones are fighters. Besides the warforged, you have the elementals in the beginning and end of the quest, various forms of defenders (metal dogs), iron golems, oozes, and in epic settings you have the lightning guard constructs. The most striking thing about Haywire Foundry is that race against the clock at the end. I remember when I first did this quest had some many panicky situations when I tried to jump out of the initial shaft that starts the “mad dash.” However, as long as at least one party member reaches Haywire and picks up the Lightning Rod then you will get the quest completion, even if you are a permanent fixture Haywire’s exploded Foundry. Overall, it is a fun quest, that can be a little hair raising, especially at the end. Give it a try if you have never completed Haywire Foundry before. Thanks for reading everybody and happy hunting in Haywire Foundry!! As our characters make their way through their adventuring and courageous careers they will come across so other intriguing adventuring parties. One of these parties includes Marek Malcanus’ disbanded party known as the Laughing Knives. The Laughing Knives were hired to test the weaknesses of the Vault of Night and in so doing the group’s failure to get past the security of the vault broke them and they disbanded. Marek will ask for your assistance in pulling the party back together and one of these party members includes an interesting character named Haywire. Haywire has an exceptional mind and is an extremely clever artificer. He enjoys tinkering and working on constructs and in fact you will need to rescue him in two different quests (Haywire Foundry and Made to Order) because his tinkering with constructs has led him into some sticky situations. However, the first instance wasn’t really his fault. Especially since those from the Inspired Quarter have penetrated his foundry and sabotaged his constructs with mind altering parasites. The second ordeal though, well he should have known better that trying to reanimate a Marut. Haywire at the end of Haywire Foundry. Being a dwarf, there is no doubt that Haywire would be a faithful and loyal companion I don’t know of too many dwarves who would turn their backs on a trusted party member but it might take some time to garner that trust. Haywire is also pretty stout. I mean dang, he literally had his arm removed and replaced. That had to take quite a bit of constitution to maintain that, even if it was magically enhanced. Haywire would be an interesting party member. As a party member, I bet you Haywire would be fun and complicated. I think he would be good and capable of getting the party out of a tough spot but I also think he would be one of the reasons why a party got into a tough spot to begin with. His ability to tinker and develop new gadgets would be extremely useful, especially with setting up traps and ambushes. I wonder how he would be as a hireling :). Thanks for reading everybody and happy hunting in Haywire Foundry. Well, I must say that I don’t have a set of runs that are very disappointing very often in DDO. However, this past weekend just happened to be one of those rare occasions. The weekend started out quite well. Friday morning, I took Berann (Level 9 Barbarian) and Containment (Level 7 Cleric), dual boxing, into Tangleroot Gorge for some slayer runs. 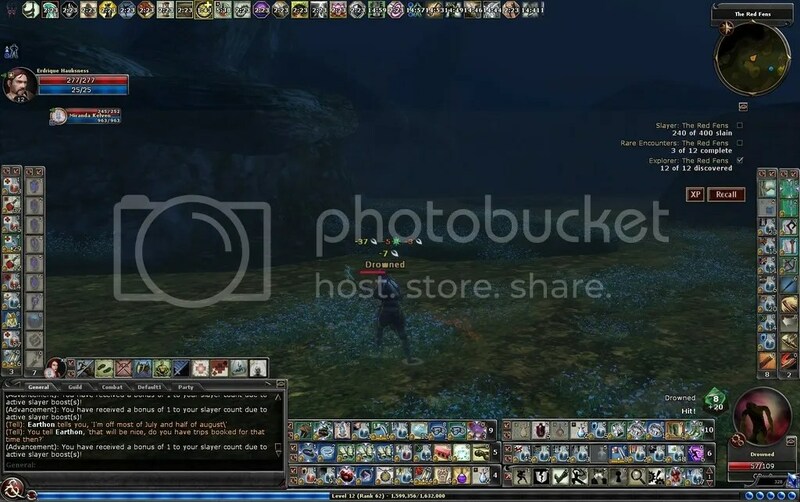 I then continued with some questing in the afternoon after I got home from work and took Erdrique (Level 23 Rogue/Primal Avatar) through the quest Reclaiming Memories out in the Isle of Forgotten Dreams. That run went really well. My disappointing runs didn’t start until Friday night. I logged on with Erdrique and this time I took him back out into Eveningstar and into the Storm Horns. For there, I made my way to the quest, A Break in the Ice and had a fun time going through the glacier to find Rungnir and to watch him then attack me. After completing the quest I forwarded the chain and was set on the path to What Goes Up. So I re-entered the Storm Horns and made the trek to the quest entrance to the capstone of the Storm Horns. Now, this is where the disappointments began. I entered What Goes Up on heroic elite, making it a level 21 quest, and made my way through the first segment of the quest and then started into the second segment of the quest after you find Oriphaun and was surprised by the Shadar-ki assassins. After some maneuvering, I was able to get past them and into the third segment of the quest where you enter onto the floating glacier. Now this is where I ran into some real problems. First off, I underestimated the number of enemies on this floating rock and was actually overwhelmed and had to get raised back up. I eventually made my way to the end fight, where I eventually realized that all of the Shadar-ki respawn and that the floating pillars need to be destroyed. I was too focused on fighting the end boss and before I knew it, all of my available resources were blown on respawning mobs. At that point, things didn’t end so well. I was in the quest for so long, that I had to call it a night. Berann and Containment returning to the One-eared Bugbear Inn from a trek into Tangleroot Gorge. Erdrique making his way through the quest Reclaiming Memories. Erdrique exploring a glacier while looking for a rogue frost giant. Finally locating Oriphaun in What Goes Up. On Saturday, I tried it again. I went back to the Storm Horns and start the quest What Goes Up once again. This time, I had issues with the first two segments of the quest at all and made it to the last fight in the third segment without any major issues at all. However, the end fight itself didn’t go so well. This time I ignored the respawning Shadar-ki as much as I could, and the ice elementals, and took down the four flight pillars. I was then surprised to see another objective come up to defeat some Shadovars. This is where I started to run into some problems. I had died once or twice before taking down the flight pillars but when I had to fight the Shadovars, I died multiple times. At first, I would sneak up to each Shadovar. While doing this, I would station my hirelings away from the top of the mountain and once I got to the Shadovar I would summon them to me and then commence to kill them. I was successful doing this for two of the four Shadovar but I eventually suffered so many deaths that all of my equipment was broken and my ability to sneak and hide was compromised. I also went through two quartstaves and didn’t have an adequate weapon to continue the fight. I had recalled from the quest about three times to use the shrine in the Storm Horns in front of the quest as well. After spending over three hours in there I had to call it a night. It was a tough pill to swallow, especially since I new I only had two Shadovar left to kill and the end boss literally had just a sliver of life. I had tried to finish him off as well, but he didn’t seem to be taking any more damage after a certain point. Oh how disappointing!! Erdrique making his way through the Storm Horns to the quest What Goes Up. What a view from the floating glacier. On Sunday, things went a little better. I was scheduled to log in with Sludgge (Level 21 Rogue/Shadowdancer). 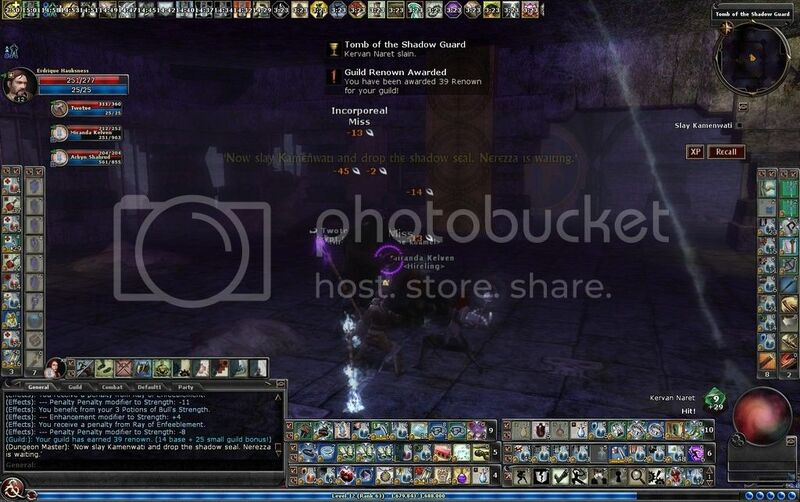 Sludgge recently finished running the Red Fens on epic normal so now I turned to the Vault of Night series and ran Tharashk Arena and The Prisoner on epic normal. Both of those runs went quite well. Which is what I needed after my horrible defeat on Saturday night :(. I called it a night after I made it through the Prisoner. Sludgge incinerating some ogres in the Tharashk Arena. Sludgge battling the thaarak hounds in VON 2. The weekend was also disappointing because I wasn’t able to get any extra quest runs in during the day on Saturday or Sunday. The past few weeks I was able to get some slayers in or some challenges completed during the day but that just wasn’t the case this weekend. Although the weekend was disappointing, I still made some progress so that is good :). I hope everybody else had a great weekend and thanks for reading!! Happy hunting in the Storm Horns everybody!! Although I have a number of characters that are level 20 and higher, I still consider myself relatively new (or at least learning ropes) to epic questing. Not too long ago, I had decided that I would work on completing quests on at least epic hard difficulties with three of my characters: Kolll (Level 22 Ranger/Shiradi Chamption), Garrrin (Level 22 Barbarian/Fury of the Wild), and Wapoyei (Level 23 Cleric/Divine Crusader). Next to my true reincarnated characters (Erdrique and Hamllin), these three characters I feel the most comfortable playing in knowing their attacks, abilities, and spells. I also feel that they are slightly better geared that my other three epic level characters (Rimuldar, Larrs, and Sludgge). However, even with that said, all of my characters can use some gear upgrades!! So, now that I have showed you a little bit about my state of mind when it comes to my various characters (well at least some of them anyway 🙂 ), I wanted to write about what I noticed when I took two of my characters, Kolll and Garrrin, through Epic VON 1, Epic VON 2, and Epic VON 3. As you can imagine, I noticed some differences right away in the abilities of Kolll and Garrrin to make their way through these quests. 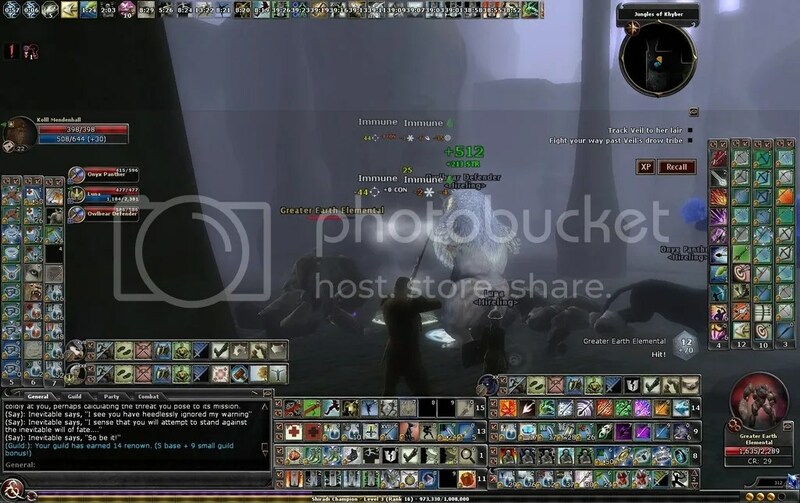 Kolll, being primarily a ranged base character, and Garrrin focusing on swinging a two handed greataxe, their abilities to handle large and dispersed mobs differed greatly. But that wasn’t what I wanted focus on during this post, I wanted focus more on the things they ran into that were similar, primarily with the overall difficulty of these quests as they compare to each other. Garrrin and his onyx panther causing havoc for the drow shaman in VON 3. VON 1 and VON 2 are level 21 quests on Epic Normal while VON 3 is a level 22 on Epic Normal. On Epic Hard, the levels of these quest go up by one and the mobs become noticeably tougher. When I first attempted VON 1 with Garrrin and Kolll on epic hard, I made it to the arena without any issues whatsoever. However, once in the arena, it didn’t take long for both of these characters to get decimated. Now, a large part of this in the beginning was my lack of understanding what I was going to be facing in the end fight, as the paragon kobold shamans really liked to drain my guys pretty good and I was ill equipped to deal with that. However, once I realized my error with those initial runs, I then found deathward items and proceeded back into the quest to only last another round when or so. Eventually, through sheer luck and grit, I completed VON 1 with Garrrin on Epic Hard but after several frustrating attempts, I gave up with Kolll and settled with a Epic Normal completion in VON 1. I just realized that Garrrin is probably a little more equipped to handle that last arena fight that Kolll. Kolll making his way through epic VON 2. However, my runs through VON 2 and VON 3 were quite different. Now I thought that VON 2 and VON 3 would be considerably harder that VON 1, especially VON 3 since it is a higher level quest. But what I found out is that Kolll and Garrrin had absolutely no problems running through VON 2 and VON 3 on Epic Hard, at all. Well, I did have some issues with Garrrin on my first attempt on VON 3 but that was because I was just being dumb about taking out some of the ranged enemies when Garrrin doesn’t really have any ranged attack damage to sufficiently take those drow down (the drow perched on the overhang after you open that door that leads to the first shrine). I just found it really interesting that I was able to blow through VON 2 and VON 3 on both characters but did so poorly in VON 1. Kolll fighting his way through epic VON 3. The main difference between VON 1 and the other two quests is the end fight. The large number of enemies during the arena fight in VON 1 quickly caused me to experience a yellow dungeon alert and didn’t take long for that to escalate into trouble. The end fight in VON 2 also has some immediate spawns, but those are just named mobs and not nearly as many therefore a dungeon alert situation was not a problem. Now the at the end VON 3 we have three little waves of enemies prior to facing the named drow, beholder, and troll. However, again these enemies didn’t spawn to the point of causing a dungeon alert on me. So the primary difference I noticed was the dungeon alert. I just need to figure out a way to care of those enemies in the arena in VON 1 quickly enough so that the dungeon alert doesn’t kick off. I guess we’ll see how that goes in my future attempts :). In any case, I found it interesting that VON 2 and VON 3 were not much of an issue for me to complete on Epic Hard but VON 1 was. Thanks for reading everybody and happy hunting in the Vault of Night!! How are the Inspired Linked to the Laughing Knives? Recently I have started to take a couple of my characters through the Vault of Night Story Arc. And one thing I noticed was that some of the members of the Inspired were involved in breaking up Marek Malcanus and his laughing knives. Now, if you aren’t sure who the Laughing Knives are, they are a band of powerful adventurers led by Marek Malcanus who were hired by House Kundarak to test the security measures of the Vault of the Night. The make up of the Laughing Knives includes Marek Malcansu (I’m guessing he’s rogue but in any case he is the leader or “mastermind” as he called it, of the Laughing Knives), Dirge of Karrnath (a fighter), Mistress Orphne (a sorceress), Veil (a vampire assassin/rogue I believe), and Haywire (an artificer I believe). 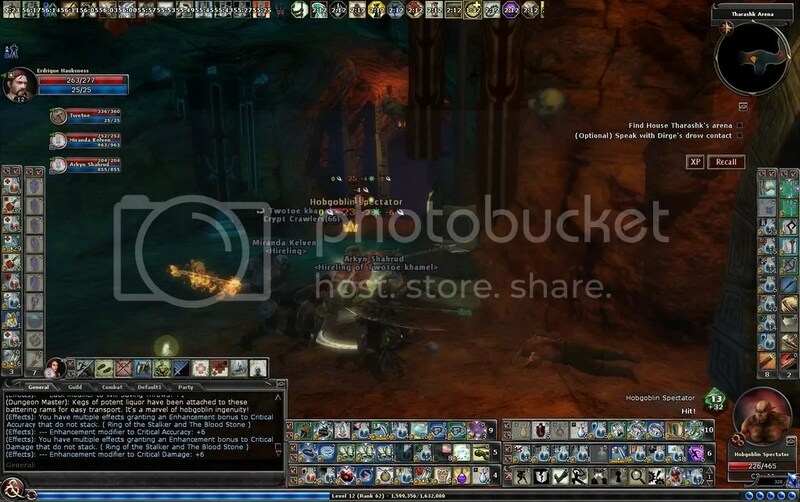 Now the Vault of Night has been around for a long time in DDO and its storyline has changed a little bit. But in its current version, two of the members of the Laughing Knives were actually involved or tricked directly by members of the Inspired. Mistress Orphne was actually drugged on an Inspired assassin and Haywire was tricked by a member of the Inspired who infected his warforged with a mind controlling parasite. So who exactly are the Inspired? The Inspired are a group of fanatical followers of the Dar Quat. They are actually being mind controlled by the members of Dol Quor of the Realm of Dreams, in particular the Devourer of Dreams. 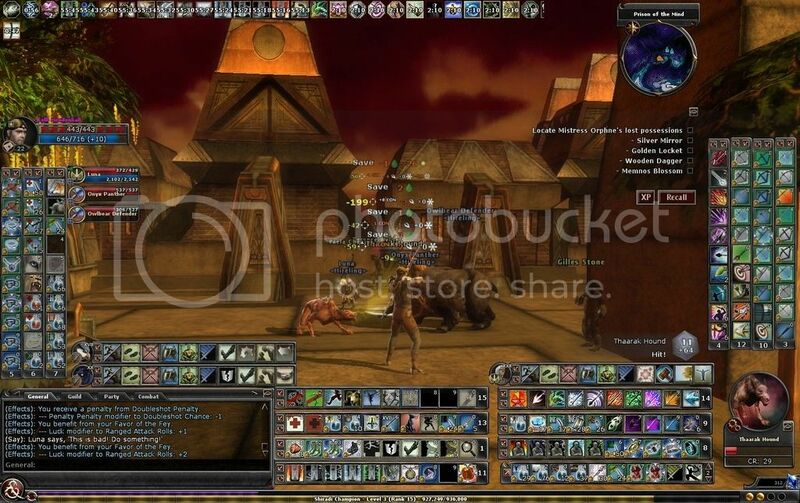 The Inspired currently have rebuild the Stormreach Harbor and are recruiting members to their cult and their storyline appears much later in the events of Stormreach. So why then do they appear in the storyline of the Laughing Knives and the Vault of Night? Everything ties back to the ever important prophecy, which details the events of the Stormreaver and the Truthful One and what will occur afterwards. The Stormreaver and the Truthful One were also hugely instrumental in keeping the forces of the Dream World from invading Xendrik and Ebberon. Therefor the Devourer of Dreams wants to keep the methods used by the Stormreaver and the Truthful One locked away, so they can’t be used again. The prophecy is also constantly being studied by the dragons of Argonesson and is continues in evolve. Well, an important part to understanding that prophecy is located in Vault of Night and once Velah got access to the Vault is when I believe the Inspired started to enact their secret plots. 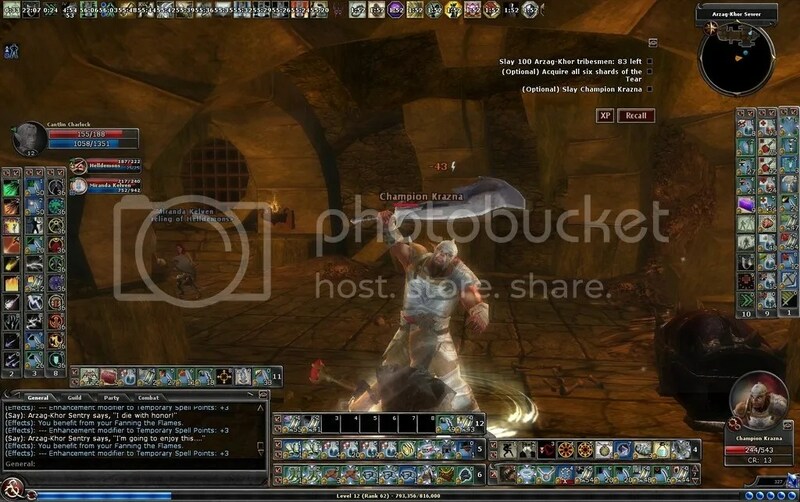 Erdrique working to get a legendary weapon for Dirge. Marek tells us that the Laughing Knives disbanded because of the failure to crack the Vault of Night, but I believe there is more to it than that. I think that when the Inspired discovered that Velah got into the vault, they learned that the contents were vulnerable and the only crew cable of gaining entry besides Velah was the Laughing Knives. As a result, the Inspired took advantage of the failure of the Laughing Knives to break them apart. So while it appears that failure was the single cause, I think the real cause of disbanding was due to the plots of the Inspired. We know for sure that the Inspired infiltrated Haywire’s foundry and trapped in his own factory by his own construct creations. We also know that the Inspired tricked drugged Mistress Orphne. But what about Dirge and Veil? Dirge lost his weapon while trying to get into the Vault of the Night and the Inspired knew that a fighter without a legendary weapon would basically be useless in such a quest. 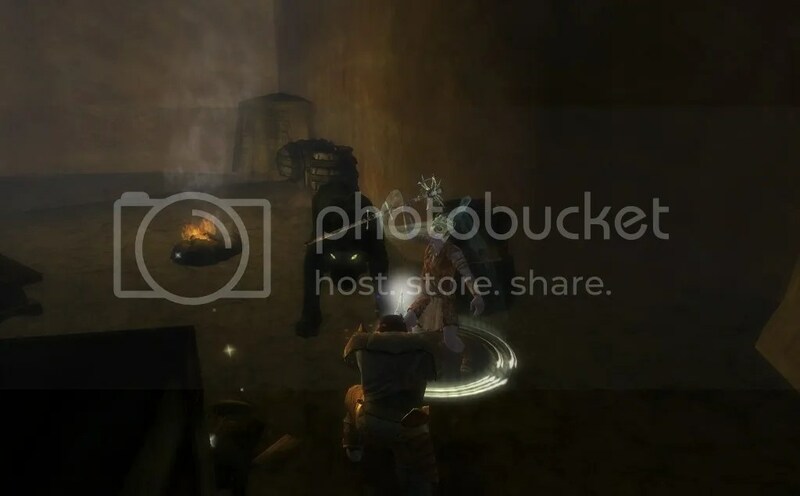 The only place to get a legendary weapon is in the Tharashk Arena and I wouldn’t be surprised if the Inspired convinced the bugbear master to not allow Dirge into the competition. So now that leaves Veil. Veil is being pursued by a tremendous Marut, the Inevitable. Well, who set the Inevitable against her? I wouldn’t be surprised at the least to learn that the Inspired are behind this assault as well. Who else would send the Inevitable against Veil. Sure, I’m sure Veil has many enemies, but who would access to such a powerful foe as the Inevitable. I find this storyline quite interesting. The story of the Draconic Prophey is laced throughout all of Ebberon side of DDO from Waterworks through Reaver’s Reach and Epic Gianthold. Learning more on how all of these facets come together, such as the Inspired and their role in the break up of the Laughing Knives, give DDO more depth and I look forward to learning more. That’s it for now. Thanks for reading and happy hunting! !